The orange-wearing, spunky ninja Naruto has starred in more anime episodes and manga issues than I'd care to count. Considering the franchise's focus on ninjas and the ninja way of life, it makes sense that videogame adaptations would come about -- and come about they have. For years, gamers have had a bevy of Naruto titles across numerous platforms to choose from, but a tragic majority of them haven't been worth the time and money. Fortunately, the Clash of Ninja series has taken Naruto quite seriously and the result has been surprisingly solid. 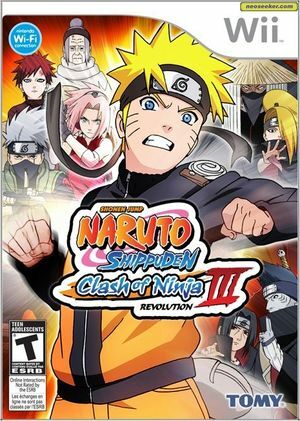 With Naruto Shippuden: Clash of Ninja Revolution 3 hitting Nintendo's Wii, Naruto fans have a legitimate fighting game to enjoy that occupies everyone's favorite ninja-filled universe. Naruto Shippuden: Clash of Ninja Revolution 3 is capable of using both GameCube controllers and Wii Remotes. If a physical controller is set to emulate both a GameCube Controller and a Wii Remote concurrently, it will operate both devices at the same time. To fix, migrate controls to use separate physical controllers. The graph below charts the compatibility with Naruto Shippuden: Clash of Ninja Revolution 3 since Dolphin's 2.0 release, listing revisions only where a compatibility change occurred. r7216 Windows 7 Intel Core i7-965 ATI Radeon HD 4890 50FPS plus some graphical bugs. r7319 Windows 7 Intel Core 2 Duo E6600 @ 3GHz NVIDIA GeForce 450 GTS 50FPS for PAL version and some special moves are invisible. This page was last edited on 3 March 2018, at 07:46.